We offer fresh Pork produced by the highly recommended methods . 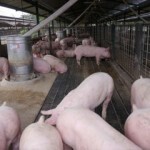 Smithsfield Farm is a 25 acre pig farm in Aripo, Trinidad, Caribbean. 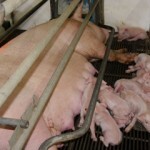 We produce top quality fresh pork. A first class facility, and clean slaughtering with experienced butchers. Smithsfield Farms delivers fresh, home grown pork through the various retails outlets in Trinidad and Tobago. They are sold as pork sides wherein the customer cuts up for presentation to the consumer. Smithsfield Farms also sells fresh pork legs for those wonderfully baked pork for Sunday lunches, pork shoulders for the times when you just want “a piece of pork”, pork bellies which are especially good for cooking that special dish of crispy skin pork, and pig feet for those occasions when only the local dish, Souse, will do. “Head to toe of pork”, that’s right, all parts of the pig are used. Like in the making of ‘black pudding’, a favorite among the people of Trinidad and Tobago. Chinese dishes call for many pork cuts, and others like trimmings which goes to the processing plant to make sausages. 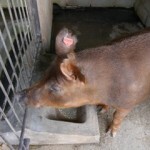 Also available are whole pigs, popularly known as Suckling Pigs, between 12-15kgs, for those special occasions. When it comes to Fresh Pork, we have it and we can supply it. Purchasing fresh pork either chilled or freshly frozen is within reach of the customer/consumer by calling Smithsfield Farms at 667-9159 or 667-9417 to place your order and a salesman will be specially assigned for prompt, reliable, courteous and efficient service.